We’d love your help. Let us know what’s wrong with this preview of Mornings in Two Pan by B.K. Froman. Every small town has its curiosities and conflicts. For Jiggs Woolsey, the most disturbing mystery is the identity of the buried skull he digs up on his Oregon ranch. Warned not to turn it in, he seeks answers about the five generations of his family who’ve previously worked the acres. His father and What if everything you know about your family is only half of the truth? To ask other readers questions about Mornings in Two Pan, please sign up. Mornings in Two Pan. I’m not sure what I expected or what I was getting into when I started this 2014 short novel from writer B.K. Froman. And I’m still not sure. Two Pan Oregon, according to an anecdote told in the novel, was named thus because gold miners back in the day said that you couldn’t get two pans of gold from the area. My father in law (God rest his soul) used to like watching home improvement shows. This was before HGTV and all the suburban flip or flop reality shows these days. He li Mornings in Two Pan. I’m not sure what I expected or what I was getting into when I started this 2014 short novel from writer B.K. Froman. And I’m still not sure. My father in law (God rest his soul) used to like watching home improvement shows. This was before HGTV and all the suburban flip or flop reality shows these days. He liked to watch Bob Villa and that sort. PBS. Or “Today we’re going to install this tile in the guest bathroom” - TEN MINUTES LATER – “Damn, I didn’t know you used sand in the aggregate.” And on and on. So Mornings in Two Pan. Not altogether earth shattering, no great literature, but good reading – and hypnotic in a weird SF kind of way. But this is not science fiction. If I had to slap a label on it I’d say it’s a modern day western. There are some strange family dynamics out in eastern Oregon, some small town goings on, maybe some outright mystery – and then TEN MINUTES LATER – you’re another few pages in and wondering where in the hell the time had gone. In spite of any logic or in any way I can articulate (I stared at the blank Word document for a while trying to decide what to say in this review) I liked it. 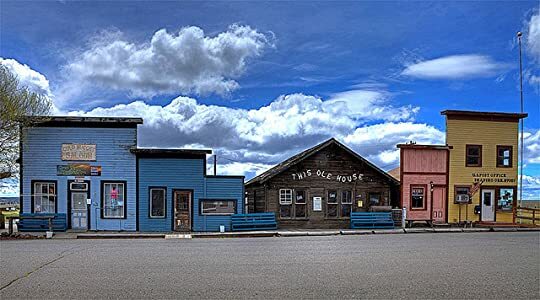 I enjoyed the detail he went to in describing various backstories and he has created a wealth of history for this small town and the families who have called this place home for generations. Froman’s characterization is excellent – the character Ox is exactly like an old guy I used to work for. A very different, unique and original kind of book. The rest of the book is, however in third person, past tense, though the transition is hardly noticeable. This is an honest and sometimes brutal tale of family and relationships and life and growing old and hardship. The writing is Fabulous. This is an honest and sometimes brutal tale of family and relationships and life and growing old and hardship. The writing is wonderful - simple and clear and it drew me in to the world of Two Pan and Jiggs and Ox and Nap. Beautifully sparse writing that said very little at times and yet all the more powerful for that. I enjoyed reading this book and give it 4 out of 5 stars. Jiggs Woolsey lives with his father and son . They run a cattle ranch in dry eastern Oregon. Jiggs uncovers a skull on the ranch and is going to notify the Sherriff when his father demands that he do nothing. The mystery part of the book is uncovering whose skull. But the book is more than a mystery. It is about relationships. Both Jiggs and his dad Ox are widowers. They do not get along. Jiggs tries to look after his dad, now in his 80s, I enjoyed reading this book and give it 4 out of 5 stars. Jiggs Woolsey lives with his father and son . They run a cattle ranch in dry eastern Oregon. Jiggs uncovers a skull on the ranch and is going to notify the Sherriff when his father demands that he do nothing. The mystery part of the book is uncovering whose skull. But the book is more than a mystery. It is about relationships. Both Jiggs and his dad Ox are widowers. They do not get along. Jiggs tries to look after his dad, now in his 80s, but his dad is just downright mean and nasty. I like the author's sense of humor: Jiggs throws away a metal cracker tin and his father has a fit and reclaims it. The tin is labeled "Strings too short to use." I picked this book based on the cover! The story is not one I'd typically read. What a treasure. Set in rural eastern Oregon, it is the story of a father and his son. The characters were well developed. I really enjoyed this story. The setting and characters in this book were vividly described and interesting (cattle ranchers in Oregon). The plot for me was a bit bland, consisting mainly of sudden revelations at the end. It looks like it's the author's debut, in which case I would say the writing shows excellent potential. It had a good ending, a bit of a shocker too. I’m being kind in giving it two stars. Utterly boring. Hard to relate to the characters. Very improbable interactions. I pushed myself to finish it so I can read something good. Stay away from this drivel. I really enjoyed this book a lot more than I expected to. The characters were funny and quirky and felt you had known them forever. There was enough mystery to keep it interesting. I would definitely read the next book in the series. The book is well written, but not a book i would recommend. I didn't enjoy reading about the difficult relationship between the father and son. A change of pace. A delightful read. I'm kind of embarrassed it took me almost a full year to read less than 200 pages, but this book just drug on forever! I went ahead and gave it three stars because even though it was slow, I still needed to keep plodding through it to find out what happened. Before I knew it, I was hooked. I found myself worried as much as Jiggs Woolsey about the skull, wanting his family history to be explained. I expected his dad, Ox, to lay out the family history between arguments early in the novel, but I realized soon enough that Ox would keep quiet (if only to annoy Jiggs for the majority of the novel). As the novel progressed, I found myself pleading with Ox to at least tell Nap, his grandson, what he wouldn't tell Jigg, but I also realized that would be an easy way out, and Froman isn't going to take an easy way out. I made my own conclusion (that Ox killed the skull's owner and was concerned if Jiggs called the cops, then Ox would take his last snide breath in prison). Jiggs, Ox and Nap, three unusual names for three generations of the Woolsey family. Three men running a ranch by themselves. The characterization in this story is excellent. I could imagine the moody and gruff Ox, always complaining and correcting anything Jiggs did. Jiggs tried to overlook Ox's constant criticism and tried to do better with his own son, Nap. Nap doesn't say much but he notices everything and he was perfectly in character for a 20's something son. The story is compelling at first Jiggs, Ox and Nap, three unusual names for three generations of the Woolsey family. Three men running a ranch by themselves. The characterization in this story is excellent. I could imagine the moody and gruff Ox, always complaining and correcting anything Jiggs did. Jiggs tried to overlook Ox's constant criticism and tried to do better with his own son, Nap. Nap doesn't say much but he notices everything and he was perfectly in character for a 20's something son. The story is compelling at first. Jiggs discovers a human skull on their dried up creek bed. He has a list of things that need to be done but his questions about the skull seem to set Ox off and upset him, so Jiggs starts digging around town and asking questions about his past that his father has never told him about. This a very well told story about the family dynamics between a father, his father and his son. The author does an excellent job of exploring the relationship between the three men, especially the father and grandfather, without being too sentimental or judgemental. The story also illustrates the issues that people with elderly parents face. As is the case here, we often judge our parents based on a lifetime of experience without recognizing that they may have been very different people in their This a very well told story about the family dynamics between a father, his father and his son. The author does an excellent job of exploring the relationship between the three men, especially the father and grandfather, without being too sentimental or judgemental. This is the folksy, down-home, sometimes humorous story of a farming family that finds a skull while fixing their fence. The question becomes, what to do about it in this small town that is chock full of family secrets that many think should never be told. This is the first of three in the Two Pan series. It includes lots of down-home how-tos that will warm your heart and make you wish for the good old days. Froman tells an engaging tale, well written, surprises, and it ends well. It's my kind of book not only for similarities, more because it's different from mine. My two novels are also set in the dry, sparse, eastern two-thirds of a western state with small town ways. Similar setting and long ago event still affecting the people. That intrigued me as I enjoyed the great difference. I'm itching to get started on the second Two Pan. This book was interesting. I was surprised I liked the characters, I really didn't thunk I would at first. I was looking for a quick read over the holiday and found that I was really getting into it. The lives of the characters are such that it could be anyone, not super rich, beautiful people with a generic crisis. The characters have realistic issues that could be put upon anyone. I am looking forward to more of the series. A fair, somewhat lighthearted treatment of change, loss, and figuring out that your parents were people before you knew them. I've read better, sure, but this wasn't bad at all. This is the first free kindle book I've read in awhile that wasn't awful. It helped that I've recently been to Eastern Oregon and the Wallowas. Still not sure what genre this story falls into. The 'mystery' was very luke warm. Its sort of like a Western. It was very 'guy' oriented. The plot developed slowly. I stuck with it because the chapter titles were so awesome and the characters were good and every now and then it was just quirky enough to be brilliant, even if the story was down right plodding. 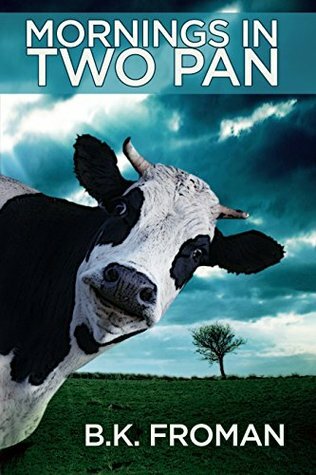 I rate this tale 5 stars because it takes the reader into a man's thoughts as he interacts with family and his rural cattle ranch and small town physical and social environment, and manages to include beautiful, poetic scenarios without diminishing the story's occasionally painful realism. A dysfunctional family tale, with three generations of a rancher family in the rural Oregon town of Two Pan. Ox, Jigs, and Nap all have their own stubborn natures and family tragedies in common. When a skull is found on the ranch property it leads to the uncovering of family secrets. A good story about the roots of dysfunction, growing older, and the impact of the past.